Surrender is not a popular theme or concept. In Texas, we are built as stubborn as they come. Mules have nothing compared to some of us when it comes to stubbornness. Just in listening to me talk alone, you might get the idea that I, and most Texans, would still rather die than give up on…well, anything. Yet, surrender is at the heart of what we as Christians are supposed to do. 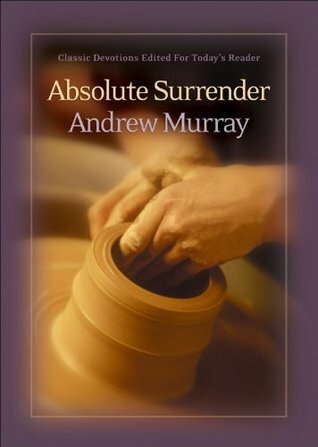 A few weeks ago, I read a powerful book by Andrew Murray called Absolute Surrender. The concept was not new to me, after all I wrote about surrender in Courage and Corruption. However, I have a tendency to start trying to take control of part of my life and I needed to be reminded of this powerful concept once again. God also knew that I would need this message for what was about to happen. When an army surrenders, they drop their weapons and offer some gesture that they will no longer fight, like raising their empty hands into the air or kneel. They are at the mercy of the conquerors and ready to do anything that they are told to. When we become Christians, we realize that we have done wrong surrender to Jesus and prepare to change our lives to match the commands he has given. After all, he conquered death and sin on our behalf. Yet, too often I try to help God by taking over parts of my heart and life. Stress, worry, heartache, and sin is the result. There are some things that happen that are out of my control, like my sister’s engagement coming to an end. I look at the hurting people around me and I have a choice: I can either surrender myself to God and allow Him to be my strength and to show me what he would have me do, or I can act on my own. It is a high stress situation and I know what I would do in that case. I normally become very self-focused (after all, I am hurting for my sister) and irritable. Having just read Absolute Surrender I was able to put some of the things that I had just learned into practice. I still struggled, but I found (once again) that when I am weak, God is strong.